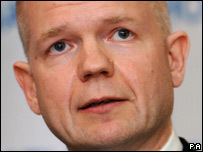 The government should update Parliament four times a year on progress towards meeting its goals for Iraq, shadow foreign secretary William Hague said. "We must also ensure that we understand the benchmarks of failure and success and heed the warnings that have been issued," Mr Hague said. The US had "much more willingness to subject its strategy to both democratic oversight and public debate", he said. He also called for Syria to be included in "constructive engagement". The shadow foreign secretary, in a wide-ranging speech to the Global Strategy Forum, said Syria should be included in talks on the middle east because it "has an impact on all the region's major issues". He said the government had "set out a plan for the reduction of British troops in Iraq and the handover of all four provinces in the British area to Iraqi control during the course of the year". "But beyond this there is silence; simply the commitment that 'the UK military presence will continue into 2008, for as long as we are wanted and have a job to do'. In the US "there has been much more willingness to subject its strategy to both democratic oversight and public debate", he said. The Iraq Study Group Report and the Administration Iraq Strategy Review had examined the US policy. And, Mr Hague said, the US "has not been afraid to commit itself publicly to issuing a report to Congress on the 'surge' strategy in July, and to completing a formal review of US strategy by September. An independent military commission will also report at the same time". In the UK, he said: "When a chief of the general staff tells the country that the continued presence of British troops in Iraq exacerbates some of the problems we are facing, and says that planning for the post invasion period was poor, we clearly have a responsibility to listen." He called on recently appointed Prime Minister Gordon Brown's government to "declare its intention to provide the clarity and transparency regarding British plans and objectives in Iraq that has been so lacking". He said the UK had been reluctant to measure success of the three goals of the UK and US - securing Baghdad, training the Iraqi forces, and achieving political reconciliation. But the Conservatives also want a quarterly report to Parliament on progress towards meeting goals for political stability, economic progress, and achieving a stable security environment in Iraq as well as providing indicators of the training and development of the Iraqi Security Forces. He reiterated his party's calls for an inquiry into the origins and conduct of the war.